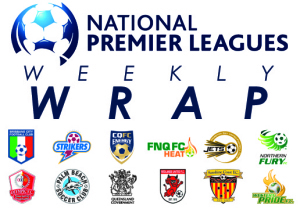 Three Brisbane clubs find themselves battling it out at the top of the table after Round 10 in the National Premier Leagues - with Olympic FC holding a seven point advantage over Brisbane City and Brisbane Strikers. 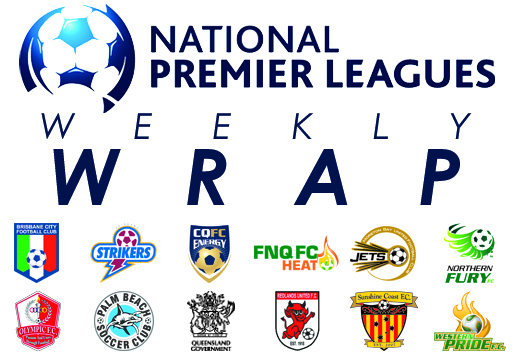 Review all the weekend's action in the weekly wrap. An inspirational four goal haul from captain Danny Byrne has inspired Olympic FC to a 5-3 come-from-behind win against title rivals Redlands United at Cleveland Showgrounds on Friday night. Olympic overturned a two-goal first half deficit against the hosts, who started promisingly when Graham Fyfe steered Jheison Macuace’s cross in at the far post on eight minutes. The league leaders replied five minutes later when striker Tim Smits nodded the ball on for the fleet-footed Byrne, who outpaced the Redlands defence before deftly lobbing his shot over goalkeeper Bradley Stout. Reuben Way restored Redlands advantage with a solid strike from the edge of the area on 18 minutes before turning provider to further extend the lead; beating a host of defenders before squaring to Macuace for the simple finish prior to the half hour. Byrne’s combination of pace and control continued to cause Redlands problems though, and the former Liverpool youth utilised both attributes to net his side’s second – racing free on a solo run before drilling his shot into the bottom corner. The skipper then restored parity just prior to the break, finishing Jai Ingham’s telling run down the right with a confident finish from ten yards out. Deflated after relinquishing their lead, Redlands faded from the contest in the second half. However it wasn’t til the 66th minute that Olympic edged ahead – Carl Tabulo curling his shot in at the far post from the edge of the eighteen yard box. Byrne then capped off a sensational individual performance to score his fourth with twelve minutes remaining, sealing the points when he finished off Matt Heath’s razor-sharp run through the heart of the Devils defence. The win sees Olympic extend their lead atop the league to seven points, while Redlands third loss of the campaign sees them drop from second to fourth on the table. Central Queensland FC Energy recorded their second win of the season on Saturday night to move off the bottom of the NPL table, defeating fellow cellar dwellers Queensland Academy of Sport 3-2 at Martens Oval in Bundaberg. The Rockhampton-based club’s decision to take the fixture 300km south to Bundaberg payed off handsomely, with Ben Millar’s 80th minute goal ultimately proving decisive in the bottom of the table battle. Energy started strongly against Academy’s youngsters, Braedyn Crowley netting for the second time in two weeks when he headed into the corner of the goal from a set piece. Ten minutes later Roman Hoffman levelled terms from a corner kick for the visitors– the 1-1 score line standing until the half time break. Prolific marksman Chris Geddes netted his eleventh goal of the campaign to again send CQFC ahead just after the restart, the Scotsman taking a touch to control Chris Swain’s cross before unleashing a typically assured finish. However, an intriguing final half hour was assured when the highly regarded Sam Cronin netted his second of the season for Academy to once again pin back the home side. Despite chances for both sides in the frenetic finale, Millar ultimately secured the three points for the Energy when he scored from Jordan Miller’s corner, consigning the Academy to the bottom of the NPL table. Brisbane Strikers have arrested a two match losing streak to move to third on the NPL table, defeating rivals Sunshine Coast Fire 3-0 at Perry Park on Saturday night. Despite the three goal showing, it was impressive defensive performance from starting debutants David Roby and Scott Coulson that ultimately proved decisive for the hosts as the young pair frustrated Fire’s attackers throughout the contest. After a hard fought but disjointed first half, right winger Jonti Richter broke the deadlock just prior to the hour – dribbling in from his flank before unleashing a venomous strike from 20 yards. Sunshine Coast had their chances, however were unable to beat lithe goalkeeper Will Rockett, who made several telling interventions in the second half to repay the faith of Strikers head coach David Large. Strikers deservedly ran away with the result in the final ten minutes – Josh Taylor adding a second for the hosts when he unleashed a sharp volley on the turn after Chay Hews’ far post header was only partially cleared off the line. Josh McVey then sealed the points in injury time, the substitute pouncing on a poor clearance from Fire goalkeeper Sam Nickolls to bear down on goal unopposed before finishing confidently. The result sees Strikers record their first competition points since April while consigning Sunshine Coast to their second consecutive defeat after last year’s QSL champions fell at home to Brisbane City last round. Moreton Bay Jets returned to the top half of the NPL table on Saturday night, defeating Western Pride 1-0 in unusual circumstances at Wolter Park. The hosts were leading 1-0 with ten minutes remaining when a power outage plunged the pitch into total darkness. After several attempts to restart the match proved unsuccessful, the result was handed to the Jets as per competition rules. It was a cruel result for Pride, who conceded in unfortunate circumstances prior to the half time break – Josh South’s strike from 20 yards taking a sharp deflection that wrong-footed Pride custodian Steve Purdy on 40 minutes. Following a see-sawing second stanza the match was set for a grand stand finale, before the floodlight failure brought the contest to a premature halt. The result will prove bitter sweet for Jets coach Terry Kirkham, who sees his side move to outright sixth position on the table with a game in hand; meanwhile Pride drop to ninth, level with Palm Beach and FNQ FC on 10 competition points. Palm Beach Sharks recorded back to back wins for the first time this season after defeating FNQ FC Heat 3-0 at Barlow Park in Cairns on Saturday night. Two goals in the final five minutes to Matt Hilton sealed the points for the Sharks, who took the lead just after the hour mark courtesy of Italian import Michele-Emanuele Crazia. Despite having the better of much of the first half Heat were unable to make their advantage tell on the scoreboard as a combination of poor finishing and Sharks goalkeeper Ryan Meskell put paid to several promises passages. The second half was a see-sawing affair, and Palm Beach saw a goal ruled out before Crazia headed the visitors ahead on 61 minutes – the central defender left unmarked to nod home from Jonathan Camilleri’s floated freekick. Heat continued to threaten - Jamie Carroll’s long-range strike bouncing back off the crossbar – but proved increasingly vulnerable at the back before Hilton’s quick fire double settled the result. On 86 minutes Hilton nodded in to double the Sharks advantage, before sealing the points in injury time with a sharp shot into the bottom right hand corner of the goal. The result continues the Sharks impressive form reversal since parting ways with head coach Oscar Langone a fortnight ago, with the Gold Coast based club surging into eighth place on the NPL ladder on goal difference. Brisbane City have recorded their seventh straight win to surge into second spot on the NPL table, defeating Northern Fury 5-0 at Spencer Park on Sunday afternoon. Eric Frazier netted a brace upon his return from suspension, with Kenneth Dougall, Yoshi Sakurai and league leading goal scorer Antonio Murray chipping in with a goal apiece. Fury found themselves under the pump from the outset, the notoriously poor travellers conceding after only ten minutes when Dougall opened accounts with one of the goals of the season – meeting Nathan Bird’s corner kick with a sublime volley. Frazier doubled the lead just prior to the half hour, the American craftily curling his strike in at the far post from the edge of the area to give the hosts a two goal advantage at the break. City ran away with the match in the second half –Murray taking his season tally to 16 goals on the hour, before Frazier nabbed a second and Sakurai completed the onslaught with his first goal for the club. The result cements City’s claims as genuine title contenders after losing their first two games of the season – the club still retaining a game in hand against Moreton Bay Jets as they seek to reel in long-time rivals Olympic FC at the top of the table.